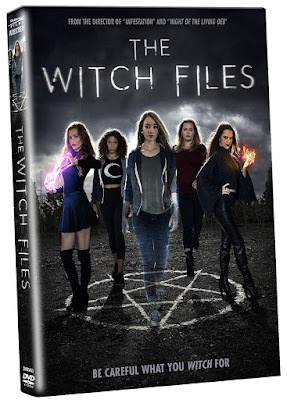 There are male characters crucial to the storyline, but The Witch Files is really only interested in the female perspective. Obviously jumping on the current upswing in narratives about female strength, our narrative begins with a group of girls meeting in high school detention after one of them fights back against a handsy male student with a reputation. From that point on, men are little more than pawns in the hands of these five teens, who discover they have natural supernatural abilities upon the arrival of a new student. Claire (Holly Taylor) is only around the other girls to film an exposé on the effects of high school detention. When queen bee Brooke (Alice Ziolkoski) decides to take Claire under her wing, the camera is brought along as well. Why another camera shows up, held by one of the other girls in order to capture Claire’s lines, is one of many gaps in logic that the target demographic is expected not to think about. Claire might be our protagonist and the one that gives excuse to the found-footage format, but it is the arrival of a new girl named Jules (Britt Flatmo) that is the real catalyst for the film’s supernatural storyline. When Jules is able to get them out of detention by setting off the fire alarm, the rest of the girls want to see more. Soon Claire and the four detention buddies are experimenting with spells and manipulating the boys at their school to do their bidding. Little do they know, the powers accumulated through witchcraft come at a price and their new coven may not be what they think. More fantasy than horror, there aren’t many thrills to be found in this film. A majority of the screen time is simply spent with the five teens mindlessly discussing the events that only take up a fraction of the film. Mostly, this feels like content that wouldn’t interest anyone but teen girls between the age of twelve and fifteen. Despite some promise in his previous features, director Kyle Rankin seems to be in autopilot directing this film. He provides the DVD with a commentary track, which is often more interesting than the film itself. There is also a behind-the-scenes featurette and a trailer.